Several weeks ago one of my readers asked for a suggestion about what to do for her daughter's birthday party on Halloween. She also mentioned her daughter's love for the color pink, which immediately got me thinking... what if pink is the new orange? (for Halloween at least). I love the combo of hot pink and black, and there's no better time to be flashy and glam. 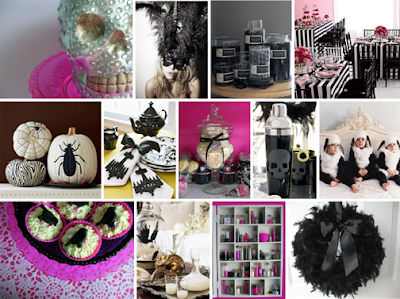 Think gothic meets glamour and decorate with a mix of traditional black Halloween accessories (ravens, skulls, lots of candles) and Paris houte couture style (chandeliers, lacy frills, feathers). Create a signature pink drink and serve it in a punch bowl with dry ice. Encourage everyone to dress up in outrageous costumes and hand out prizes for winners.... black glittered pumpkins perhaps? Hi, Great mosaic, glad you like my pics! Have a sweet day! Now I just need you to move to Atlanta and help me plan some fun parties! Fantastic - love it!! Planning a halloween party this year and scouring the web (Martha Stewart) for ideas. As always, love your site. I <3 pink and black too! I just posted pictures of my daughters birthday using pink and black. Black Gerbera daisies are perfect centerpieces for a bold statement.